Help members pay quickly and easily, with just a click. Quick Bill lets you send a link to a customized payment portal, where members can view and pay multiple Quick Bills at once. View, manage, and track all of your Quick Bills right from your AffiniPay account. Request payment in one easy step, and let members pay with just a click. Provide a custom payment portal to take your member payment experience to the next level. 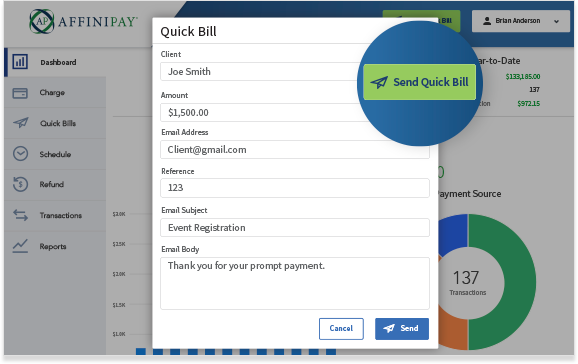 Monitor which Quick Bills are sent, viewed, or paid, and send payment reminders. Quick Bill is one of the easiest ways to request payment from your members. This robust tool lets you track and manage bills and payments in a single place, and gives your members a professional, customized, and secure payment experience. Use the Quick Bill tab in your AffiniPay account to send new Quick Bills and view the status of all those you’ve sent. Easily see which have been paid or viewed, or are still awaiting payment, and send reminders to members with outstanding bills. With Quick Bill, each member is sent to a personalized payment portal, where they can see any outstanding Quick Bills and pay one or more at a time. Track member payment trends—like whether they paid online, in person, or with cash—and use your data to better forecast future payment behavior and trends.